This is the first film after Return Of The Jedi I started obsessing over and that was mainly down to me meeting my friend James back in nursery school.He adored everything about the film (and Christopher Reeve) and it rubbed off on me. I remember hours of playing Superman as little kids. The only down part for me at the time was I always had to be Lex Luthor to his Superman lol! 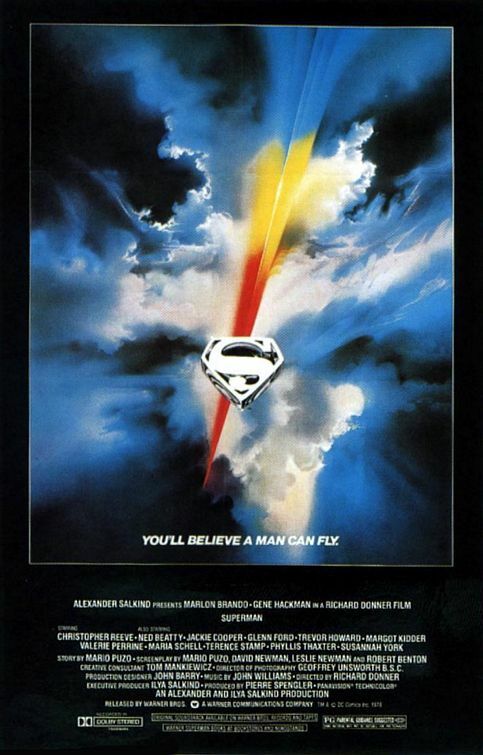 Nice memories, unfortunately James passed away a few years ago but because of him my love for everything Superman continues and will carry on I imagine until I am telling my great grand kids that the cartoon "Superman 3000" isn't a patch on the Superman in my day.So anyway, Superman The Movie. There is no way I will ever get bored of this film.Marlon Brando has me from the moment he appears on the screen as Jor-El and condemns Zod and co to the Phantom Zone. I know at the time he got paid a stupid amount of money for his small amount of screen time but I think he is definitely worth it. The scenes with him in have always left a lasting impression with me.Christopher Reeve himself will always be my Superman. His portray of Clark Kent has is touching and he does such a good job in the first film. His Superman is the best and although in later films I think he lost his way a bit (I'll save that though for now) he shines here.One scene that sticks in my head is the one with a young Clark after Jonathan dies and he says - "All those powers. And I couldn't even save him"Chokes me up every time and funny enough doesn't feature Reeve (well, his voice is in it).Margot Kidder is stunning as Lois Lane. I've often wondered if Teri Hatcher based her Lois on Margot Kidders version from the first film? I think there are a few similarities.My favourite scene with her is the first time she meets Superman and nose dives down the side of the building after falling from the helicopter.The scene with her during the earthquake and when Superman loses it used to scare me as a child.Gene Hackman is 100% quality as Lex Luthor. I've said before he is my absolute favourite apart from maybe John Shea who even I'll admit is a close second when it comes to playing Luthor.A wonderful film.